If my Mom of blessed memory were still alive, she would tell me to run out the the store to purchase heavy sweaters and a extra warm winter coat. In fact after reading this story she would issue a major Jewish Mother Sweater Alert all because there is new evidence that the Earth may be heading toward an ice age (please stop crying Mr. Gore). NOAA also reported record or near record colds for the lower that the lower strastosphere (about six to ten miles above the Earth’s surface) even though the concentration of greenhouse gases, continued to increase. “Even with all this data manipulation, the trend is down as shown by this Hadley global plot,” writes Joseph D’Aleo, former director of meteorology at The Weather Channel. “Last year was the 8th warmest but 7th coldest since 1998. They explain it away with the predominance of La Ninas or a solar blip, but say it was the warmest decade nonetheless, so stop questioning us,” he said. It is the smallest solar maximum we have seen in 100 years,” said Dr David Hathaway of Nasa. We are currently in solar cycle number 24 which is about half as active as cycle 23, but cycle 25 is likely to be smaller again due to changes in the magnetic flux on the sun’s surface,” he said. …The fall-off in sunspot activity still has the potential to affect our weather for the worse, Dr Elliott said. Research by Prof Mike Lockwood at the University of Reading showed how low solar activity could alter the position of the jet stream over the north Atlantic, causing severe cold during winter months. This was likely the cause of the very cold and snowy winters during 2009 and 2010, Dr Elliott said. The point is anybody who says there is a scientific consensus regarding global warming is either lying, trying to redistribute income internationally, have a business investment in “green energy-related products, or just plain stupid! Taking Earth Science as a freshman in college during the 1970s, we were taught that because of historic global cycles most scientists believed the Earth was likely heading for a cooling period, possibly even an ice age. Many scientists today believe that the lack of solar activity means what the Earth Science professor taught is coming to fruition. 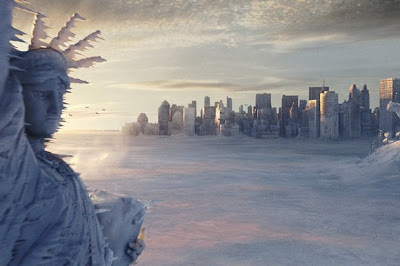 One does not have to believe that there is an ice age coming, but there is enough scientific evidence disputing the Global Warming theory to throw it into doubt. Especially when you consider even the climate change gurus acknowledge it hasn’t gotten warmer for a decade and a half and the doom/gloom predictions of the last twenty years have turned out to be false. Heck we might be at the start of a building consensus about the coming Ice Age (maybe you should buy warm gloves with that new winter coat).